Download and install SoundCode for Dolby Digtal 2 by filling out the form. 1. 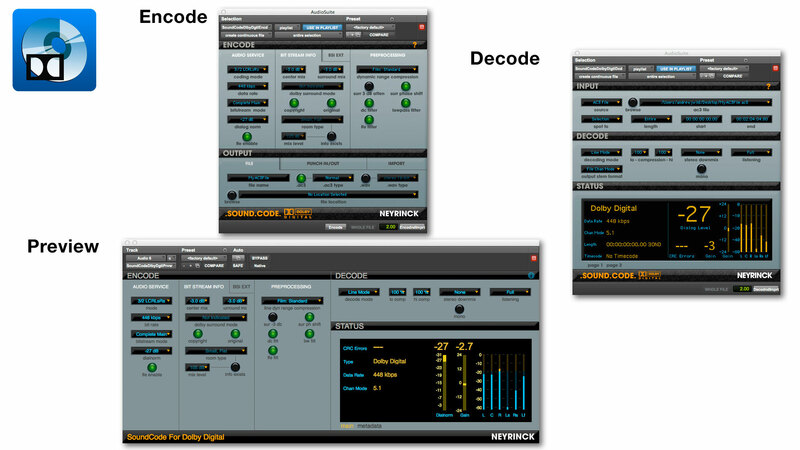 SoundCode for Dolby Digital 2 can be purchased from the Neyrinck Store or through our extensive list of worldwide Resellers. Upgrade pricing is also available from SoundCode for Dolby Digital 1. You will receive full iLok licence via email. 2. Download the latest version of the application by filling out the form below. Download the latest version of the application by filling out the form below. A 14-day full trial is available. Trial license requires internet connection and an iLok. You will receive an email from us offering a full 14 day trial using your iLok. Pro Tools 10 is the last version of Pro Tools that version 1.X is compatible with. Legacy installer available below. AAX Native 32/64, Pro Tools 10 and higher. Version 2 includes a special legacy version 1 installer for use with Pro Tools 10.3.6 and earlier. The new Preview plug-in is only available in Pro Tools 10.3.7 and later. The Preview plug-in is not compatible with 44k sessions at this time.